We’ve been keen of late to highlight the dizzying variety of possible multiple bets (doubles, trebles, fourfold etc) available and indeed how the returns that come your way really can be quite mind boggling if you find yourself backing enough winners. Many people are put off by placing bets on horse racing accumulators and the like because they think they have next to no chance of seeing a return, but the irony is that it’s at least an approach to betting that’s odds to chance, meaning that it’s a ‘fair bet’. In the long run you certainly stand a reasonable chance of getting returns with multiple bets when compared to most other popular forms of betting. For instance if you ever get the chance of looking at the actual chance of getting 5 or 6 numbers up in the national lottery compared to what you win for doing so, you’d be amazed at the terrible odds you’re placing your bet on at. Case in point, the odds of getting 4 numbers is 2180-1 and 5 numbers is 144,415-1 . When you think of the average prize money for each of those outcomes, it’s a crumby bet. Why not instead place a well considered treble or acca on the horses using exclusive tips or by analysing form! Even at the bookmakers how often do you see people piling their money into fixed odds betting terminals? They would be much better off just trying to analyse horse racing form and try to draw conclusions about what’s a good bet and what isn’t to push the odds in their favour somewhat. Of course that can apply to single bets too, as it’s all about finding value. Still, the added bonus with multiple bets is that you really don’t ever have to place a big bet and when you do win, you receive a healthy return at worst, and at best you can really clean up! Some of the examples I’ve listed previously include people winning hundreds of thousands, or even 1 million+ from a small bet of just a few pounds. With some skill and a dollop of luck you can go a long way. Get involved! Bet Type Updates and More! 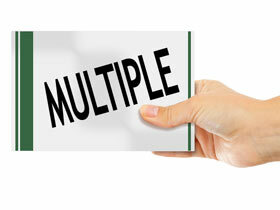 Unless you’ve been checking the multiples site frequently you might have missed a couple of recent updates to the site. First and foremost, you can now access write ups on all of the various accumulator / multiple bet types available on the right hand side of every site page under ‘Bet Type Explanations’ . 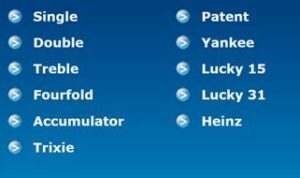 Whether you’re eager to learn about single bets, doubles, trebles, accumulators or any of the various types of multiple bets like patents, yankees, lucky 15 and so on, just click through and you will soon be in the know! Of course there are so many ways of betting and types of bets that we aren’t finished yet, so expect further updates in this area soon! Next up, be sure to check out our regularly updated big accumulator wins page for inspiration when you’re feeling like you’re chasing rainbows every time you place multiple bets. With a bit of skill, perseverance and of course a healthy dollop of luck, you’d be surprised how much you can win with a very modest bet. Don’t stop believing!